Red with No Farmers/No Food in black. 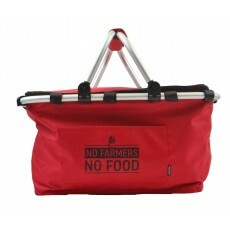 Collapsible nylon basket features a spacious, insulated interior and zipper-closure. 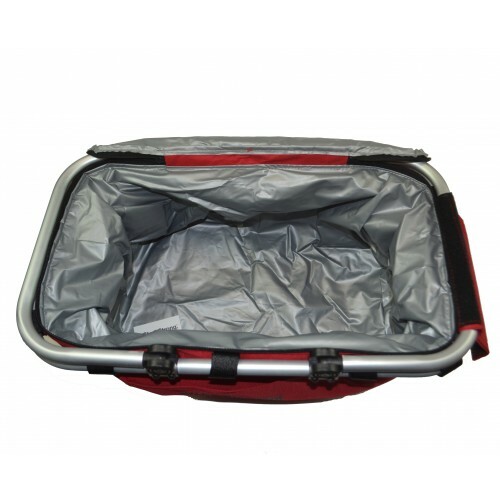 Lightweight aluminum frame designed with pivoting handles, which fold down for convenient, compact storage. Front slash pocket holds napkins, utensils and other picnic essentials within easy reach. Coordinating handle wrap with Velcro®-closure ensures carrying comfort. Size: 9-3/4" x 11" x 19".